Adrian Lam hopes his players can put on the blinkers at Castleford tonight following Gabe Hamlin’s doping charge. The Australian prop has returned home after being suspended by the RFL for a UK Anti-Doping violation - which has understandably overshadowed their recent upturn in form. The Warriors are aiming for a third successive victory and Lam doesn’t think Hamlin’s off-field episode will throw a stick in the spokes as they prepare for this evening's televised clash. “I’d hope,” said Lam. “He was a popular member here and if you know him personally, he’s very likeable, it wasn’t something you could see coming. Wigan’s players have certainly had experience of ignoring off-field dramas this year. They were docked two points the day before their Super League opener at St Helens - later reclaimed on appeal - and have had to deal with the uncertainty surrounding the coaching situation for 2020 as well as Craig Mullen’s arrest for drink driving. In addition, they struggled to find their form on the pitch, losing five games in a row before victories against Salford and Catalans lifted the gloom. “We’ve been through a tough period on the field with the losses and we feel we’re in a good place now,” said Lam. “The losses was different for me, because as a new coach you don’t experience the levels of expectations as high as anywhere else. “The way I’m responding is it’s going to make me a better coach. “I’ve got great players and staff around me. We’re in a pretty good place right now, as long as the players believe in me and the processes, which they have been, we’ll be okay. “What happens off-field, that’s part of the coaching role as well. It’s not ideal but it’s a process you go through and make sure you handle it correctly. “All our focus is making it three in a row. Lam has experienced the hostile Castleford ground - and short pitch - as a player. “It’s a tiny pitch, a tiny dressing room, and that’s part of what makes Super League so unique - every club, every ground is different,” he said. 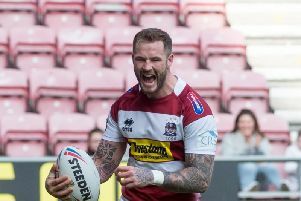 Of course, one player who may receive the most vocal reception is Zak Hardaker, who is set to make his first return to the club where he was sacked from following his doping suspension at the end of 2017. “He may cop a bit of flak but the players are there to support him - it’s part of sport,” said Lam. “He’s improved every week, and that’s been the focus to get him.